This document outlines how to access our community communication streams. BetaNYC is rooted in community. Before “civic tech” was a thing, we started as a meetup focused on open government, transparency, and openness. We continue to embrace meetup and have grown our online outlets for you to connect amongst yourselves. One of our more social outlets is the “NYC Civic Technology, Design, & Open Government” facebook group. With over 800 members, it is one of the most active outlets where members near and far share news, articles, and projects. Recommendation: This is a great site if you’re looking to promote something socially. This is the major online communications channel for BetaNYC. Members can create an account and join, being able to post and reply to what other members in the community are doing. This is also the site through which members can post items that get into “the Message”. To get items into “the Message” you can post in the following categories: General, Events and Jobs. In addition, there are several other channels, ranging from Open Data Corner to Developers Corner and Working Groups. Signing up for an account is easy, and afterwards you’ll have the ability to contribute and promote interesting projects. Recommendation: Use talk to share posts that will be shared out across BetaNYC’s social streams. This is the most direct way to reach out to members of the BetaNYC community. In order to access the Slack, type in betanyc.slack.com into your web browser. If you have not signed in before, you will be asked to enter an email address and password. These login details will give you access to the BetaNYC Slack. The first thing you will want to do after signing in is to join the #general channel. This channel is constantly updated with posts on things like new jobs and interesting events going on in NYC. To get an invite to join the Slack, go to < http://slack.beta.nyc >. Add your email and then press “Get My Invite”. After you send out your request, someone will accept it. Afterwards, you will want to login to < https://betanyc.slack.com > with your email. After creating and entering a password, you will be taken to the BetaNYC Slack! Recommendation: BetaNYC uses slack for its internal operations and communications at events. This is a great, real-time communication resource. To subscribe to The_Message, click on < http://bit.ly/BetaNYC_Newsletter > and fill out your information, including: email address, name and zip code. You will also be asked your preferred format, either HTML or plain-text. Please choose one. The message goes out to over 3,000 subscribers. To get into “the_message”, post your item on talk.beta.nyc in one of the follow channels: General, Events or Jobs. Use the tag #message to promote your item. Afterwards, BetaNYC will selectively retweet or promote items via “the Message”. If you want to ensure we see your requests, go to the #ops-message slack channel and submit your talk link.. If you have something already written that you’d like published, that is great too! Do not hesitate to send it in. 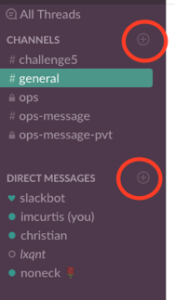 To join a channel in Slack, find “Channels” on the left hand side bar. This sidebar keeps track of all conversations that you are connected to, both between individuals and the larger groups. Next to “Channels” and “Direct Messages” you will see a “+”, click that to write a new message to a group or someone in particular.